Looking for commercial office cleaning in Sydney, NSW? Evolve Cleaning are the leading experts in providing high quality office cleaning services to local businesses. Evolve Cleaning has been helping businesses maintain a clean, fresh and pleasant environment for their staff and visitors for over 22 years. We understand the importance of having a well maintained and clean business premises. Our expert cleaners provide exceptional service and are always on time. So you can get back to focusing on your business and leave us to providing a superior level of service with our commercial cleaning. We offer each of our valued clients with a flexible and personalised level of cleaning program that is specifically made to suit your office cleaning needs. Our team of professional commercial cleaners are skilled in providing a detailed and thorough service. Unlike our competitors, we take the time to listen and understand your wants and needs to recognise areas where we can help with your office cleaning the most! Why choose Evolve for professional office cleaning? With a long track record of providing outstanding service to our clients, at Evolve we are proud of the reputation we’ve built. Our staff are all highly trained and understand that every business has its own individual needs, and will go above and beyond to not only meet but exceed expectations. 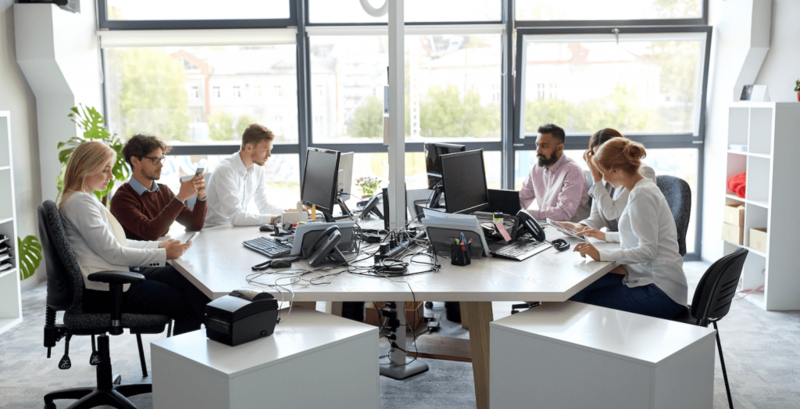 While some cleaning companies may overlook areas of your office, the team at Evolve are thorough and cover all the extras, like cleaning and organising your desks and workspaces. A clean work environment is not only more pleasant to work in, it has also been proven to boost productivity. We clean offices of all sizes all across Sydney, New South Wales. Whether your office is in Sydney’s CBD, Eastern Suburbs, The Hills District, Inner West or The Sutherland Shire we have you covered. Our local office cleaners will ensure that your space is vibrant and spotless. No matter where your office is located in Sydney, give us a call for a free inspection today. Major commercial office areas that we regularly clean include Sydney CBD, Parramatta, Surry Hills, Norwest Business Park, Pyrmont and Barangaroo. From the chairs and coffee table in your front office lobby to each desk and chair in the office, we can clean and sanitise your entire work area to keep it looking great. This also ensures that bacteria can’t spread throughout the office. It is vital that bathroom areas are cleaned thoroughly to ensure your bathroom is not only well presented at all times, but also to ensure that nasty germs don’t spread. At the end of a busy day in the office, bins become full of waste disposal including food items, paper and more. Evolve will empty all of your bins and add in new, fresh bin liners so no nasty smells remain the next morning. We professionally vacuum all of your office carpeted areas at no extra charge. At Evolve Cleaning, we believe in going the extra mile to achieve excellence in everything we do. Need to find a reliable cleaning service for your office? Fill in the form below with your name, email, phone and requested details and we will call you back to arrange a time to meet with you in person and inspect your premises. All quotes are complimentary and there is no obligation. For a superior service that is affordable, get in touch with Evolve today and experience for yourself why more businesses choose us to meet all of their cleaning needs.